Mention of a Reading Room was made in 1880 when a town collection raised funds for Northampton Infirmary. "The practice adopted at Rushden of reserving a portion of the amount for the purpose of obtaining letters of admission to the Infirmary, adds considerable force to the annual appeal, the letters thus obtained being issued in the names of the Chairman and Secretary of the Rushden Club and Reading Rooms." The Fire Station Minute Book 1903 was purchased from the Argus Office, when Charles G Jowitt was the manager. 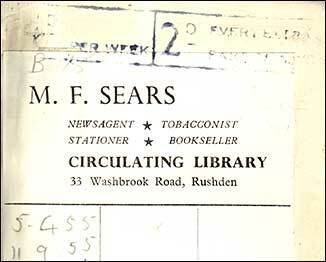 Its label states the services offered were printing, library and stationery supplies. 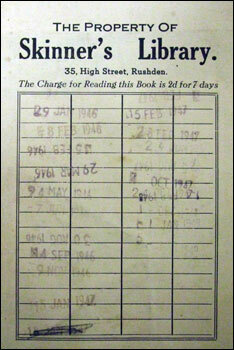 Books changed at any time during business hours. Subscription for one book at a time, changed as often as necessary, 1/6 per quarter. Subscribers of one guinea per year may have five books out at once for family use. Subscribers of half-a-guinea per year may have two books out at once. Occasional Subscribers, 2d. per volume. Catalogues now ready, price 3d. The First Annual dinner of this organisation was held at the Coffee Tavern, Rushden, yesterday evening, Mr. John Claridge presided, and there were also present: Messrs. G. Bayes (secretary), J. Wilmott, W. H. Darnell, W. E. Sargent, A. Wilmott, E. Cunnington, J. Parker, C. Parker, C. Rogers, H. White, A. West, W. Brown, C. Hobbs, M. Bates, E. Clayton, O. Massom, G. Sanders, T. Parnell, F. Miller, C. Ashby, W. Clayton, W. Howard, W. Parker, R. Clipstone, E. Clarke, J. Spakes, H. Linnett, and A. Will. Miss Cox provided an excellent repast, and a vote of thanks was accorded to her for the manner in which she had catered for the enjoyment of those present. During the evening the following programme, arranged by Mr. G. Bayes, was carried out:  Song, "Fatal wedding", E. Brown; recitation, "Hodge and the vicar" A. Vest; song, "The midshipmite", W. H. Darnell; song, "Show me the girl with her golden hair", H. Hobbs; song, E. Clarke; song, "The old musician", A. J. Parker; song, J. Bates; song, "Poor old Joe", C. Ashby. The Golden Century Circulating Library will open on Saturday, March 2nd. E. Hewitt, High-street, Rushden. Two other libraries - set up after the Carnegie Library in 1905. 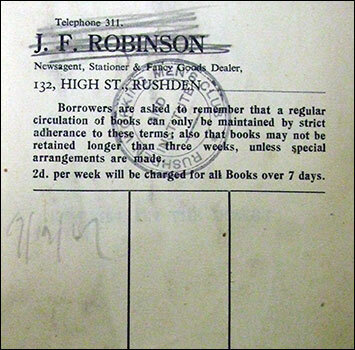 Above, a library label for J F Robinson's library at 132 High Street. It was only borrowed once on the 17th December 1907. 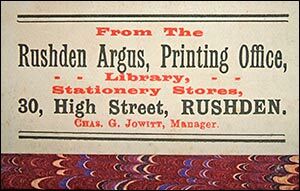 The overstamp reads "Rushden Working Men's Club & Institute". Charged at 2d. per 7 days. Above, a library label for Skinner's Library at 35 High Street. It was issued 20 times in two years, 1946 & 1947.